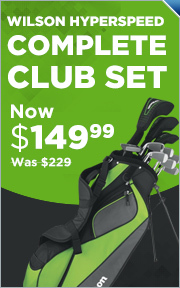 TaylorMade golf clubs are some of the most popular clubs in the industry. They introduced the first steel-headed woods in golf and has led the golf industry’s technological evolution ever since, including having the first titanium golf driver in the winner’s circle of a golf major (Mark O’Meara, 1998 Masters, Ti Bubble 2 Tour). TaylorMade continues to push technological boundaries in golf with innovations such as Flight Control Technology (FCT), Moveable Weight Technology (MWT) and Relative Amplitude Coefficient (RAC) technology. TaylorMade is currently ranked among the top performers in golf equipment among tour players. GlobalGolf.com is proud to offer a wide variety drivers, fairway woods, hybrids, irons, wedges, and putters manufactured by TaylorMade Golf. Our inventory of new and preowned TaylorMade golf clubs changes on a daily basis, so check back often for our most current inventory.